Dr. Ellen Pullins, Schmidt Research Professor of Professional Sales at The University of Toledo, has been awarded a Fulbright Scholar grant to lecture and research at Hagaa Helia University in Finland during the 2014-15 academic year. The United States Department of State and the J. William Fulbright Foreign Scholarship Board made the announcement. 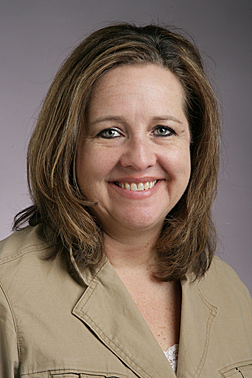 Pullins is one of approximately 1,100 U.S. faculty and professionals who will travel abroad through the Fulbright U.S. Scholar Program in 2014-15. She will teach professional sales and conduct research on professional business-to-business sales in international markets, specifically on customer-affective response to professional sales. “Obviously, I was thrilled on being notified that I had received the grant. I believe that business can’t be separated from international business in today’s world, and that international experiences for faculty are critically important,” said Pullins, who is director of the Edward H. Schmidt School of Professional Sales in the UT College of Business and Innovation. “I am excited about the ability to immerse myself in a culture outside the United States for an extended period of time, while at the same time building productive new relationships in another part of the world. In the past, the Schmidt School of Professional Sales has done international videoconferenced sales role-plays between students in Finland and UT. I can’t even begin to imagine what other types of collaborative projects might be possible,” she said. The Fulbright Program is the flagship international educational exchange program sponsored by the U.S. government and is designed to increase mutual understanding between the people of the United States and those of other countries. The primary source of funding for the Fulbright Program is an annual appropriation made by Congress to the U.S. Department of State’s Bureau of Educational and Cultural Affairs. Participating governments and host institutions, corporations and foundations in foreign countries and in the United States also provide direct and indirect support. Since its establishment in 1946 under legislation introduced by the late Sen. J. William Fulbright of Arkansas, the program has given approximately 300,000 students, scholars, teachers, artists, scientists and other professionals the opportunity to study, teach and conduct research, exchange ideas, and contribute to finding solutions to shared international concerns. “I am confident that this will have a real impact on the effectiveness of my own teaching in the future, as I will be able to speak firsthand about many of the international aspects of business, and also incorporate a more global set of real-world examples,” Pullins said. This entry was posted on Thursday, April 10th, 2014 at 3:07 am and is filed under Business and Innovation, News, Research, UToday .